Absurdly young but talented luchadora in Monterrey. She states that debut was on [[August]], [] in exhibition matches. Made her debut in [[The Crash]] at [[Auditorio de Tijuana]], she was the surprise luchadora presumably the winner of The Crash tryout. She teamed up with [[Latigo]] against [[Christi Jaynes]] & [[Danny Limelight]] and [[Baronessa]] & [[Último Maldito]]. Absurdly young but talented luchadora in Monterrey. She states that debut was on August, 2007 in exhibition matches. 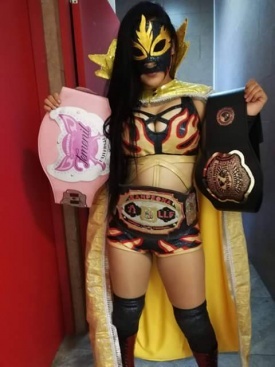 Made her debut in The Crash at Auditorio de Tijuana, she was the surprise luchadora presumably the winner of The Crash tryout. She teamed up with Latigo against Christi Jaynes & Danny Limelight and Baronessa & Último Maldito.